I just received my first batch of enamel pins made from my design. I think they turned out pretty cute. I designed the pins and the coordinating backing cards in Affinity Designer. I find it more user friendly (nodes, selections easier to see, fewer and easier to understand steps for some actions) than Adobe Illustrator. I did take the finished .eps file into Illustrator to convert it to an .ai file for the pin manufacturer. screenshot of Affinity Designer showing large nodes pen tool uses. This is an example of a finished Illustrator design file to be sent to the pin manufacturer. It includes a larger image of the pin, the pin scaled to fit the 1" size to show the finished image size, and the colors wanted for the pin. To assure the colors of the finished pin match the colors you want, it is best to have the design file show the colors as Pantone Solid Coated colors. You can buy Pantone color cards from the manufacturer or on Amazon. They are expensive and tend to be sold as a set of coated or uncoated color guides. Ebay is another source where you might find the coated color guides by themselves. 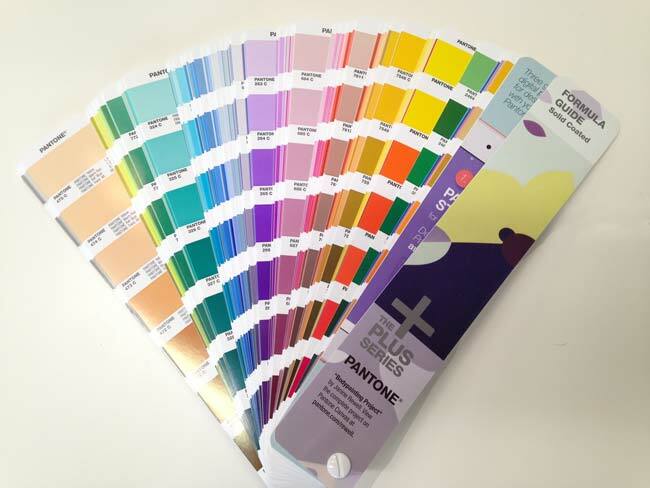 Illustrator also has the Pantone Coated colors under Swatch Libraries, Color Books, Pantone Solid Coated. Affinity Designer has a drop-down menu in the swatches for Pantone Solid Coated. The colors of the online Pantone color swatches are not as true as the physical Pantone color guides as they are seen differently in different monitors, but they are a pretty good approximation. When designing a pin, size and number of colors are the main characteristics to consider as far as price. The larger the pin (size determined by largest size), the more expensive it is. Usually 4 colors are included in the base price. Then the price goes up for each color added. So when designing a pin, it is good to keep the number of colors used to 4 or less. 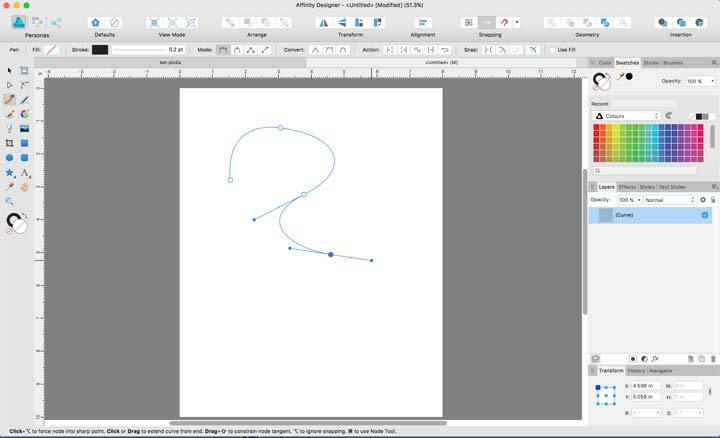 Take your design into a vector program such as Adobe Illustrator or Affinity Designer and make it into a vector image by doing an Image Trace in Illustrator or trace using a pen tool or pencil in Affinity Designer. Draw your metal lines in the color you wish to indicate for the metal color - light grey for silver, dark yellow for gold, and black for black metal lines. The colors inside the lines represent the enamel. For enamel pins, the color inside lines must be solid and flat, no gradients. or patterns. Lines should be no smaller than 2 mm. for hard enamel and 1 mm. for soft enamel, and spaces between lines should be no smaller than 2 mm. Lines will become metal, and shapes can be designated to be metal in finished pin also. Remember that the pin will be small. Simplify the design so details show up well in the small size. You can draw a square the size of your final pin, 1" for example, and then scale your image down to fit into the square. Print it out to see how it will look in the final pin size. I decided to have a back stamp logo added to my design. This is a design stamped on the back of the pin. It gives your pin branding and is kind of like signing a painting. The back stamp is made as a separate mold with a separate fee added to the total pin cost. It is a one time cost though, as it can be used for future designs. Kat Pin, hard enamel pins are now available in my Etsy shop. I did some testing on some sticker materials. 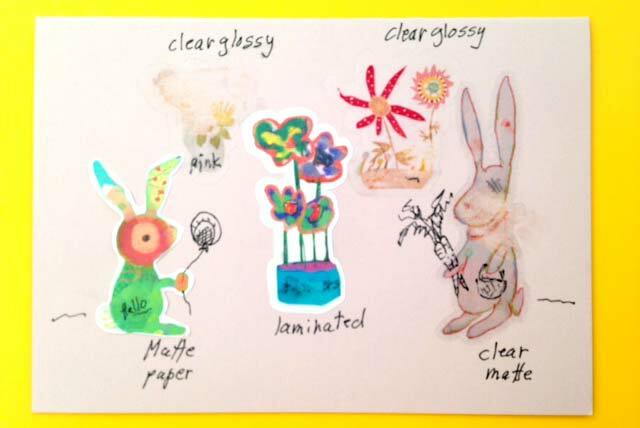 I tested matte paper, clear glossy, and matte paper laminated with clear glossy adhesive laminate. I test them for writability with pen and pencil and with water. In the photo below, I have tried writing on the stickers with both pen and pencil. All of the sticker materials could be written on with pen. The pen markings on the matte paper, clear glossy, and clear matte sticker paper were stable when I rubbed over them with my finger. The laminated paper however, smeared easily when rubbed. I would not recommend writing at all on the laminated paper. The matte paper and clear matte sticker paper were the only ones that could be written on with pencil. The pencil markings did not smudge when rubbed. Next I tried rubbing the sticker materials with a damp kleenex. I also wet the paper the stickers were on right next to each sticker. The pen and pencil did not run on the matte paper. The image itself did not run, but there is a slight water stain that remained after the water dried. The printed images on the clear glossy and clear matte sticker papers completely wiped off where they were rubbed with a damp kleenex. They are definitely damaged by water. The damp kleenex did not affect the printed image at all on the laminated paper sticker, although it rubbed off written pen on the surface of the laminate. I tried wetting the cardstock next to the laminated sticker, and the sticker still was not affected. The laminated sticker seems to be fairly waterproof. For the last test, I adhered a laminated paper sticker to the lid of a small plastic box and took it to the sink, and ran water over it. It still looked unaffected. Then I rubbed some liquid soap on the box lid and washed it off, rubbing lightly with my hand. This time I saw water had seeped onto the edges of the matte paper under the laminate. The paper dried and appeared undamaged, but the sticker image ink bled very slightly around the edges of the sticker. The laminated paper sticker should not be attached to objects that will be washed. The sticker testings showed some of the uses the stickers were suitable for and some of the uses that weren't ideal for them. There are a few iPad painting programs that either automatically record your paintings as they are created or that you can set beforehand to record as you paint. Procreate, SketchClub, Sketchbook Pro, are some current paint programs that allow you to create videos of your paintings in process. In this post I'll talk a little about recording video in the Procreate app. While you are working on any painting in Procreate, Procreate is automatically making a video of your work in progress behind the scene. At any point, you can click on the little wrench (Actions) icon at the top left of the screen, then click on share and then send your video to email, Dropbox, ITunes, or even save it to your iPad Photos. The video above shows an unfinished Procreate painting in progress. Watching the video, it is interesting and helpful for me to see my process. Sometimes I find a place where there was something I liked but got changed. sometimes I can go back and recreate it. This painting started out in ArtRage, as do many of my iPad paintings, because I love to capture the oil brush and watercolor brush textures. Then I usually save the image and open it up in Procreate. Most of the ArtRage painting gets covered up, but I like to leave some of the texture. The progress video shows me adding a second image on top of the first image and then keeping only parts of it. I used some copy and paste and transform in the painting. Near the end of the painting, I accidentally added a big green line across the girl's face when I was pinching out the screen to magnify the area I was working on. You can see me deleting it in the video. I love using the videos as tools to help me remember my process and to help me remember how I got certain effects. Last week (December 29 and 30) I took 2 days worth of Kelly Kilmer art journaling workshops at Ink About It, a rubber stamp store in Westford, MA. Kelly was a wonderful teacher and the classes were great fun. The second journal was a hardback journal with a sewn signature and a variety of papers used for the pages. We made each journal in a very short amount of time which was very liberating. The rest of the workshop was spent working on some of the pages. Kelly had inspiring ideas on designing journal pages and also a ton of writing prompts. We tried out lots of supplies (many were new to me) -- various pens, decorative papers and tapes, stamps, and transparencies. 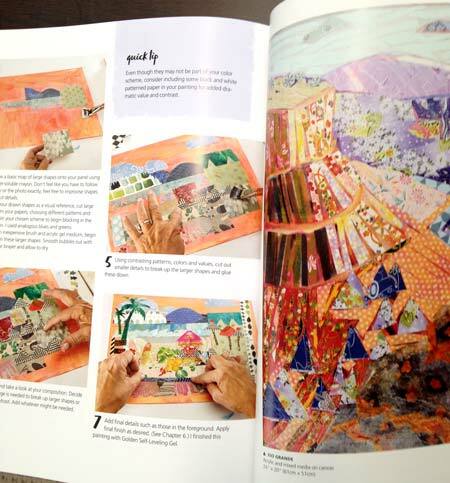 The way Kelly paced the classes so that we worked very quickly without too much planning made art journaling seem like a doable rather than an overwhelming process. I love reading all kinds of craft blogs and especially enjoy learning about artists from other countries. Until recently if a blog was in another language and didn't have a translation option, I would pore over the images and try to guess what the blogger might be saying. Finally I found a Google translation bookmark that can be added to your favorites and will translate any page by clicking on it there. The link is here. Just pick the button for the language you want to translate to and drag it into your favorites in the sidebar. Then when you find a blog in another language, click on the bookmarklet in your sidebar and it will translate the blog for you. If you click on "older posts" on the blog, the next page will be translated also. The English translation definitely is good enough to give you the idea of what they are saying. Chuck Berry, rock and roll legend also known as "The Father of Rock and Roll", was born in St. Louis and still lives in a suburb of St. Louis today. He and the St. Louis landmark restaurant and music club, Blueberry Hill, have a strong connection going back many years. Chuck Berry has been performing at Blueberry Hill for the past twelve years. He celebrated his 80th birthday there with a special standing-room only concert. And at the age of 83, he still performs a concert there one Wednesday a month. His concerts sell out, so buy tickets in advance. Blueberry Hill is a perfect place to visit if you are a rock and roll fan. Located in the historic Delmar Loop area, there are shops and galleries to explore and the St. Louis "Walk of Fame" with stars of famous St. Louisans dotting the sidewalk. You can start your afternoon exploring the area and end off the evening with a casual dinner at Blueberry Hill. When you enter the club, you are enveloped with rock and roll and pop-culture nostalgia. The walls are covered with memorabilia from Chuck Berry and Elvis Presley, pop-culture memorabilia, and vintage jukeboxes. The food is casual, but delicious. Some of the Blueberry Hill specialties are the famous St. Louis Toasted Ravioli appetizers, chicken wings, and hamburgers. Waiters are friendly and can tell you about Chuck Berry's next concert date. The next time you visit St. Louis, check out Blueberry Hill and the Delmar Loop. If you are lucky, you can even catch a memorable Chuck Berry performance. You can learn more about the Delmar Loop area here. Paris - we visited Paris a few summers ago. It was like a surreal dream, ancient mingling with avant-garde, beauty everywhere. Some of my favorite memories are from that visit, and included a very special evening in which we visited my French penpal and her family and had dinner at her house. When you go to Paris, two must-sees are La Conciergerie and Giverny which is about forty-seven miles outside the city. La Conciergerie, which dates back to Roman times, was built as a Roman fort, torn down and rebuilt as a castle around 1300 A.D., and was used as a prison to hold artistocrats and royalty during the French Revolution before they were guillotined. On the Conciergerie tour, we were able to walk through the prison up and down the ancient stone steps and view the prison cells. The cell where Marie Antoinette lived during her captivity has been recreated. The feeling of past history was overwhelming there. Giverny, the beautiful home and garden of Monet is about forty-seven miles outside of Paris. Giverny is a magical place, worthy of spending a full day exploring there. The best time to visit, of course, is the summer. In June or July, you can fully experience the magnificence of the garden. The garden is full of color, with flowers spilling out onto the paths. And across the road is Monet's famous water garden. The dream-like lusciousness is breathtaking. Monet's simple, but exquisite house, has a pink exterior with green shutters. Ivy vines climb over the walls. His love of color extends from the garden to the house exterior and continues inside with each room painted a different striking color. There is an lovely blog written by one of Giverny's guides that you may like to check out, Giverny Impression. Thank you, everyone for coming to visit and for entering my giveaway! I am excited to be participating in the One World One Heart Giveaway this year. This is the third year Lisa of "A Whimsicial Bohemian" is hosting this wonderful event started to bring bloggers from all over the world together. You can read more about it and see the list of all the participants (over 1000 so far!) by clicking on the logo below. There are so many wonderful blogs to visit! 1. Leave a comment on this post by February 15, 5:00 P.M. Eastern Standard Time. 2. Please be sure your comment takes me back to you, if not, make sure to leave a email address where you can be reached. 3. You should have a blog to enter as this is a blog event. The winner will be picked on February 15 and notified by email. Our dog Chloe was the inspiration for Clio. Most of my art is designed at least to some degree as I work on it. When I am working on a teddy or other artwork, I frequently come to a place in the making, where I am stuck on a design decision. I may have several options I am considering, but am having trouble picking the right one. I try adding the different options temporarily and going back and forth looking to see which I like best, but it is hard for me to tell this way. Recently I started taking digital snapshots of my various design options. This way I can quickly go from one to another and view them in the camera. This also puts an extra step in the viewing (like looking at your work in a mirror) so your view is less biased and more distanced. I have found this so helpful. If I am really still stuck, I can upload them to my computer and view them at the same time in a photo-editing program. Here are some snapshots I used when designing the face of a mohair rabbit and the accessories for a bear. When I was making this rabbit, I couldn't decide what type of mouth to make, even after trying out one then the other using pins to hold the mouth in place. Finally I took a digital snapshot of both variations and by comparing the photos was able to choose the upside-down V mouth. Here is Isabel before her accessories were added. I tried two types of bells and a flower with a tarnished copper chain, and then a fabric collar with a large vintage pearl button. I took digital photos of each variation and was intrigued to see that they all (except the flower variation) seemed to give her a boyish quality. I had already decided that Isabel was a female bear. My final solution came from a combination of ideas from the flower pendant and the button collar as you can see here. It is fun to see where people do their creative work. I love visiting people's studios and thought it would be fun to visit studios of bloggers through photographs. I started a new collaborative blog, Studio Shots - Tuesday, where people can share photos of their studio or anything in their studio. To participate, take one or more photos of your studio. It can be a general photo of the room, a photo of some work in progress, a corner or section of the room, a wall with things that inspire you, studio guests including pets, etc. If there is interest, each week one participant will be highlighted by having a preview photo and link to their post in the body of that week's post. Participant's blogs will also be added to a blog roll. Price Tower is the tallest actualized skyscraper designed by Frank Lloyd Wright. (He designed one other vertical structure, the S.C. Johnson Wax Research Tower.) You will find it in the seemingly unlikely town of Bartlesville, Oklahoma. However, a little digging into the history of Bartlesville shows that Bartlesville was a town that developed because of the oil industry in Oklahoma. It was home to wealthy oil barons and their wealth is reflected in the several examples of architecture by well-known architects. Price Tower was commissioned by H. C. Price, founder of H. C. Price Company, an oil and gas pipeline company. The design of Price Tower is based on a tree, but is a geometric, stylized design. Frank Lloyd Wright himself called it, "the tree that escaped the crowded forest." It has a center core with the actual floors, triangular shapes, coming out from the center like branches of a tree. The outer color is pale beige concrete and green copper. It has the appearance of a very stylized pine tree (squint your eyes and use your imagination) and is quite an amazing sight rising up from the town. Price Tower is a fascinating place to visit. Viewing the unique exterior is exciting in itself, but there are also interesting tours of the building that take you through some floors of the building where you visit the office of H. C. Price and an apartment with original built-in furniture and wall designs. During the tour you learn about the design and history of the building. You also learn biographical information on H. C. Price, and Frank Lloyd Wright. Frank Lloyd Wright's use of built-ins and wall and ceiling design including embossed wall panels in the interior give the building a cohesive design. The beautiful two-floor apartment has a very stylized look with built-in furniture and bas-relief designs on the walls. You can see vintage photos of Price Tower including two photos of an original furnished apartment here. Price Tower was conceived as a multipurpose building which would include corporate offices, retail space, and apartments. In keeping with the original purpose of the building, there is now a museum gallery on the first floor. When we visited Price Tower, the exhibit showing there was 3-logy Triennial 2008: Imaginative Qualities of Actual Things. The exhibit included work by international contemporary artists who used junk and found materials to create their art. There were two fascinating 3-dimensional mosaics that were large portraits. When you walked up close to the portraits, the images faded and you saw old toys and pieces of junk attached to the canvas in an interesting design. When you walked back and viewed the mosaics from a distance, you could see the portraits. Another appealing work was a grouping of large jellyfish made from bubblewrap. You can read more about the exhibit here. Next time you are in the vacinity of Bartlesville, Oklahoma, I recommend visiting Price Tower for an interesting exploration of a unique Frank Lloyd Wright building and a wonderful museum gallery. To see more on what to visit in Bartlesville, please check out the previous post, "Next Time You Visit Bartlesville I- Woolaroc". My husband's parents are now living in Broken Arrow, Oklahoma (a Tulsa suburb). When we visited in December, my father-in-law suggested visiting Woolaroc in Bartlesville - about an hour's drive north. Woolaroc was the weekend retreat of Frank Phillips, founder of Phillips Petroleum. It sits on the outskirts of Bartlesville, Oklahoma. Established in 1925, Woolaroc consists of a 3,700 acre wildlife preserve, a fascinating museum of western and Native American art and artifacts, Phillips' rustic weekend lodge, a family mausoleum, "two living history areas" and a nature trail. The wildlife preserve which surrounds the Woolaroc Museum and lodge is home to both native and exotic animal species. It has a stark, rugged beauty - the dominant color of the landscape in late December was a burnt orange. Driving the long, narrow road through the preserve, we saw buffalo, several species of elk and deer, goats, and ostriches. Some of the animals were fenced in specific areas. 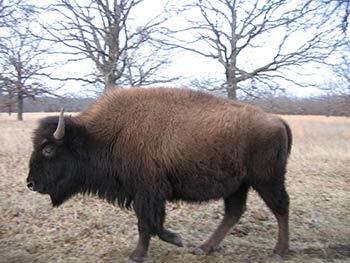 Others, like the buffalo (or American Bison) seemed to have free roaming range, including the preserve roads. In addition to the beauty of Woolaroc, the history of the estate is quite interesting. Frank Phillips used the estate as a retreat and guest house spending a lot of time there and entertaining many guests there on a regular basis. His guests included friends, business associates, local Native American tribe leaders, and even gangsters. The comfortable, rustic style of the lodge helped guests feel at home, and helped Phillips close many business deals. To feed his many guests, he had the large dining room in the lodge laid out like a cafeteria rather than a formal dining room. The lodge is a large log cabin style consisting of a big living room and a dining room that looks more like a cafeteria on the first floor, and eight bedrooms on the second floor. Although Phillips wasn't a hunter, his lodge walls are covered with animal taxidermy heads ranging from deer and buffalo to zebra, giraffes, lions, elephants, and crocodiles. Apparently Phillips collected animals, including exotic game, for his wildlife preserve. Animals that couldn't adapt and died were preserved and used for the animal heads. Woolaroc Museum is a large two-story museum that contains the personal collection of Frank Phillips. And it does appear to be more a personal collection than a carefully indexed and edited museum. Phillips' collection was later increased by donations made by members of the Phillips family. The museum contains primarily western and Native American paintings, sculpture, and artifacts including pottery, bead work, hatchets, and clothing. There are works by several prominent Western artists including Frederick Remington and Charles M. Russell. Scattered through the museum are sculptures of pioneer women. My daughter and I found this exhibit dating from a 1927 contest very compelling. The museum also houses a small doll collection and a huge collection of Colt weapons. At the end of the day as we were leaving Woolaroc, we saw herds of bison all walking back toward the direction of the lodge. They walked determinedly towards "home" in a long, scattered group. They crossed back and forth across the road and even walked along the road. 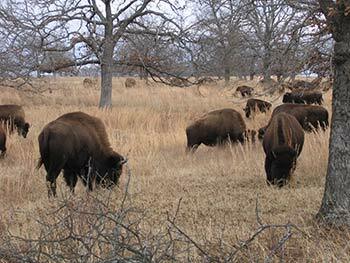 When we passed by groups of the bison, we were so close to them, we could have reached out the car windows and touched them. Finding inspiration sometimes seems like an allusive process. I find inspiration from looking at books, attending art exhibits, visiting flea markets. I especially love books of patterns such as 1000 Patterns: Design Through the Centuries by Drusilla Cole and find ideas for both 2 and 3 dimensional work from historical patterns. I also have a passion for children's books. Vintage children's books, such as those by Johnny Gruelle, have enchanting illustrations. Sometimes I just leaf through books, then close them and get out a sketchbook. I love going to art, natural history, and science museums . When I go to museums, I take a sketchbook and make quick sketches of details, textures, and shapes that I am especially intrigued by. Visiting galleries is also a wonderful way to see what other artists are doing. Flea markets are a favorite pastime of mine. I take a camera and ask vendors if I can photograph their booths. They are usually very accommodating. If I come home without any treasures, but have gotten some inspiring photo shots, it is still a successful trip. Sometimes I just open my sketchbook and start doodling. I may have an idea in my head as a beginning point - such as "poodle". I try not to think too much, but just draw. These doodles may turn into the starting point for a piece. I also like to participate in Illustration Friday when I get the chance. It's a fun challenge to try to develop an illustration to match the weekly theme. The resulting drawings can give me ideas for new work in a different medium, and I enjoy visiting other artist's blogs to see their illustrations, too. There are two blogs that I always find inspirational: "Art for Housewives" and "Ullabenulla". In the most recent post from Art for Housewives, the author talks about an interactive project at the Victoria and Albert Museum in London. 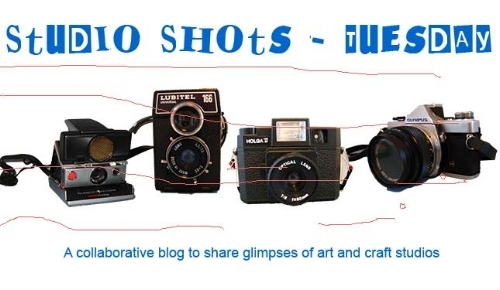 The public is invited to send in photos of pockets they have created. The photos along with information and name of the artist are included in the museum's database for pockets. Ullabenulla shows photos of her work and the work of other artists along with updating what is going on in her studio including classes. In Ullabenulla's latest post, she shows a series of endearing miniature kitchenware made of acorns. You can find inspiration in the most unexpected places: even a hotel bathroom or staircase.